PASADENA, Calif. — The New Kids on the Block are set to announce a tour soon, but the Boston boy band’s fans won’t have to wait until summer to see Donnie Wahlberg, Joey McIntyre, Danny Wood, and Jonathan and Jordan Knight do their thing. The quintet are launching a new reality series, “Rock This Boat: New Kids on the Block,” Wednesday at 8 p.m. on the Pop network. Formerly the TV Guide Network, the outlet launches this week, rebranding itself as the home for fans, which makes “Rock This Boat” savvy programming. 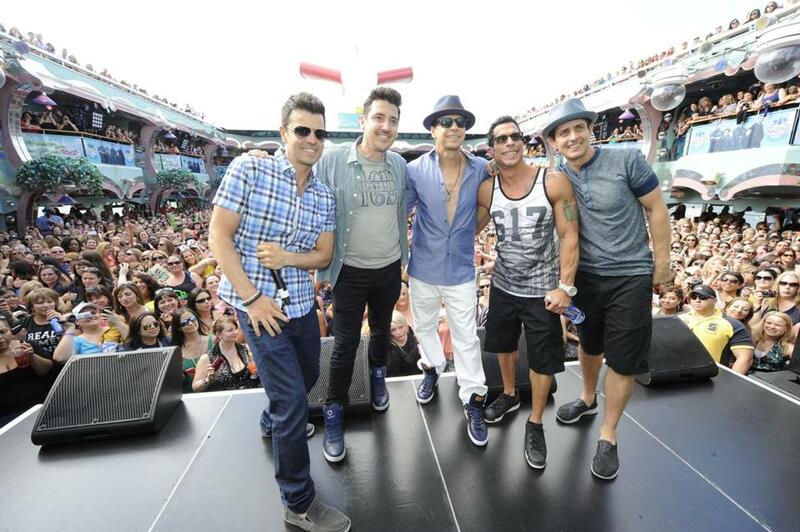 The eight-episode series will follow the adventures of several NKOTB fans as they embark on the group’s annual Caribbean cruise. Band members stress that it is about the fans, not the band. Dannyelle Zywan and Norm Charest can attest to that. The couple are featured in the series and got married on the trip. Although they’re still planning some sort of celebration on dry land, they say most of their relatives who couldn’t attend have forgiven them. “They’re getting better because they know they can actually see the wedding on television,” says Zywan. They will also be able to see NKOTB take part in the nuptials, much to the couple’s delight. “I was floored that they were involved and how they were involved,” says Zywan. “We’ve done the cruise enough to be secure in how it’s done, and we’re not going to work with people who aren’t going to be honest and real and open,” says McIntyre of opening up the floating party to the cameras. “I think it has a franchise potential for us,” says Schwartz, noting that there are many artists who do cruises and that they would like to board those ships as well. Wahlberg says he’s been approached by several significant acts about setting sail for future installments. “There’s something really interesting going on with these things, and we want to follow it,” says Schwartz.